➜ Open your browser and navigate to my.aivan.ai. ➜ Enter your username and click ‘Done’. ➜ On next screen, enter your password and click ‘Sign In’. In case you have forgotten your password, click on ”Forgot your password?” –link and follow the instructions. NOTE: Only administrator can manage account setting. To access Account management, select ‘Account settings’ in user menu. 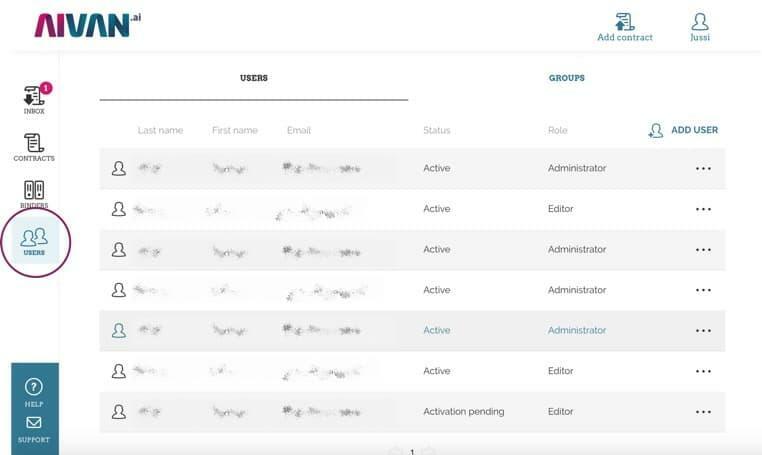 In ‘Organisation’ tab, you can manage your own legal entity data. 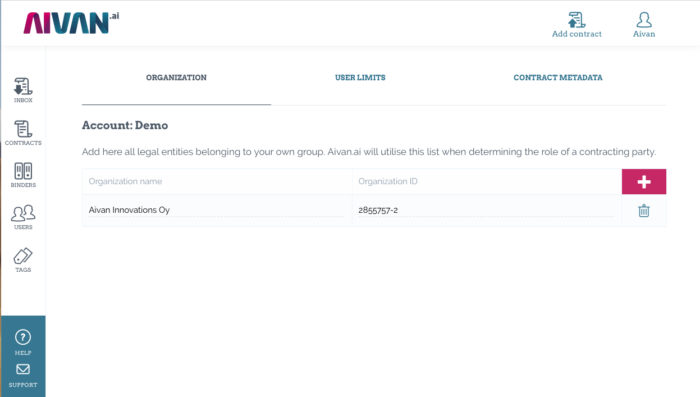 Aivan.ai will utilise this list when determining the role of a contracting party. ➜ To edit existing legal entity, just click the text you want to edit. Remember to save your changes after the edit. ➜ To delete an existing legal entity, click the Trash can icon behind it. This tab will show the total number of user licenses per user type, as well as the number of available licenses. In this screen, you can determine if new user can or can’t by default create tags. Note: this tab is only visible for such accounts, which have the ‘Custom metadata’ module activated. 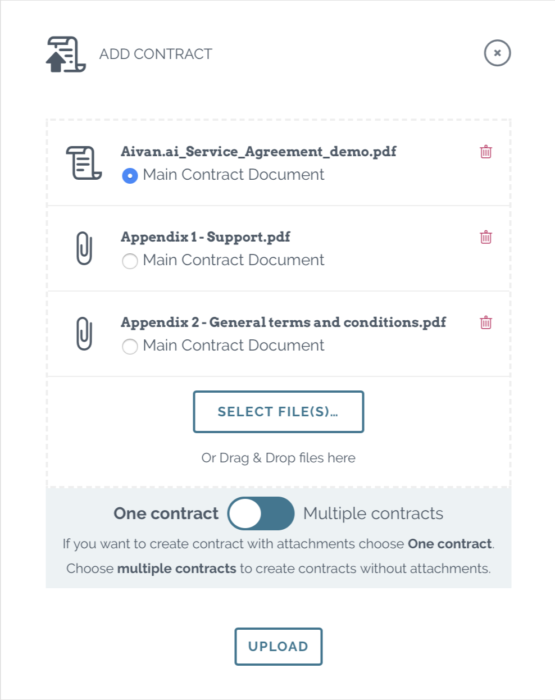 In case you are not seeing this, but would like to manage the contract metadata for your account, contract Aivan support (support@aivan.ai). 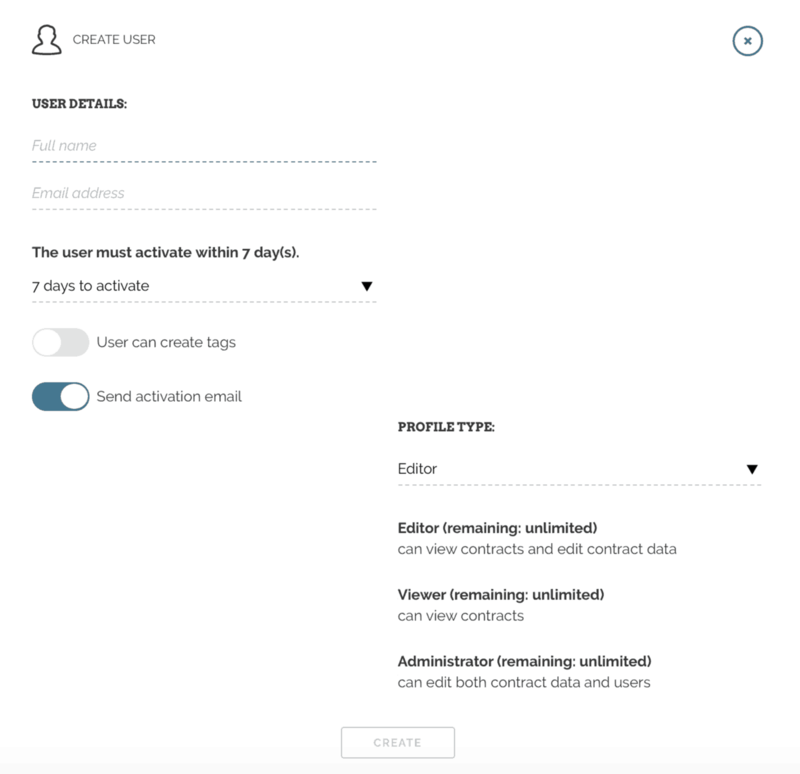 In this tab you can manage contract metadata. Watch video below to see how. 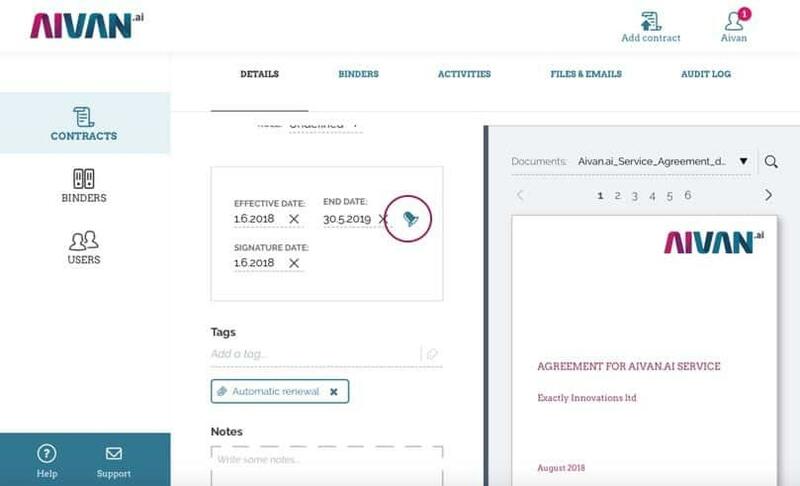 Easiest way to add a new contract to Aivan.ai is to send it by e-mail. Video below shows how to do this. 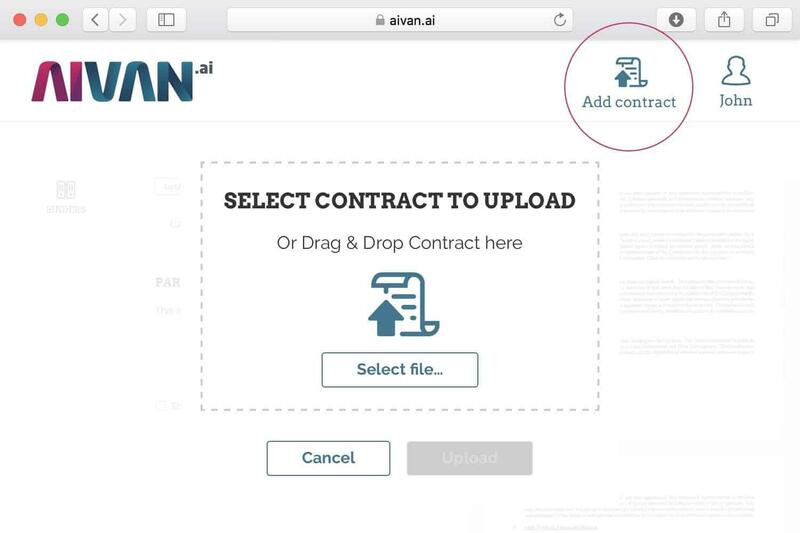 You may also add new contract in Aivan.ai directly from the application. ➜ Click on ”Add Contract” -icon (top right corner). This will open the upload pop-up. ➜ Drag the contract file(s) on upload pop-up window. Alternatively you may click the ”Select file…” –button to open the file browser and select the file(s) using it. 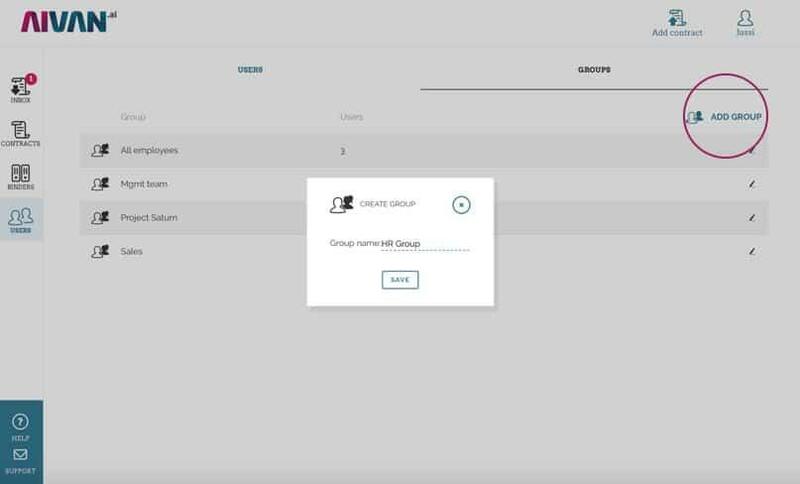 ➜ You may upload several files at the same time: either as a single contract (all files are related to this same contract) or each file as a separate contract (switch on the bottom of the upload dialog). ➜ If you upload several files as one contract, mark the main contract file by clicking on the contract, NOTE! The main contract must in .pdf or .tiff format. ➜To start the upload, click on “upload” button. Your contract(s) will now appear in “Inbox” view. It will go through the very same AI process as if sent by e-mail. As long as contract’s status is “processing”, you can’t do much with it. But once the status changes to “Not review”, you may click on the contract thumbnail and enter the same review screen as in e-mail process. You can change the contract status with quick menu on contract thumbnail. ➜ To archive your contract, click “Archive” button. Note: Archived contract does not show up on the Contract Desktop or Binders. Nor it is taken included in search results. You can find archived contracts with search filters. ➜ To delete the contract, click “Delete contract” button. You may organize your contracts using binders. Binders are also practical for user rights management. You may create as many binders as you wish. Binders are hierarchical, thus you may create binders inside of a binder. ➜ If you wish to add a new binder inside of on existing binder, navigate to that specific binder and click “+ New Binder” icon in that specific binder. ➜ Click “…” icon to open the action menu for that specific binder. ➜ Select “Rename” to rename the binder, “Remove” to remove the binder. You can manage the user rights on the binder level (as well as on contract level). 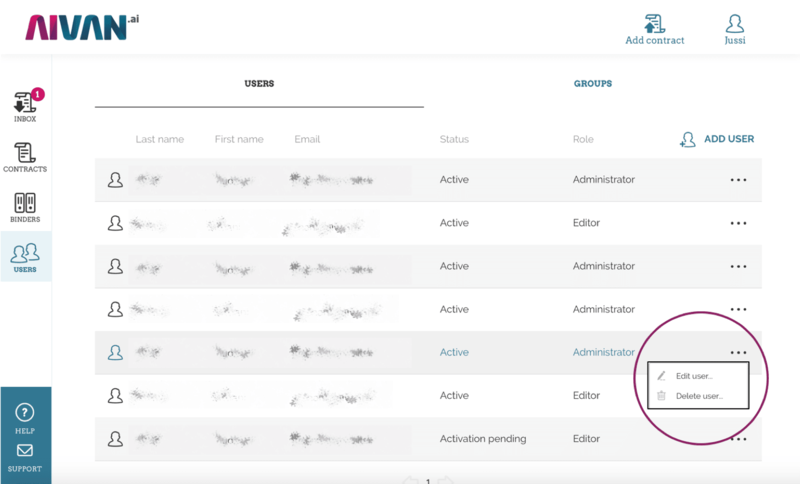 ➜ You can either add a new user or user group to the binder. To do this, either click ‘Add User’ or ‘Add Group’ button. ➜ After that, select the user or group you want add to this binder and then the permission level (view / edit). 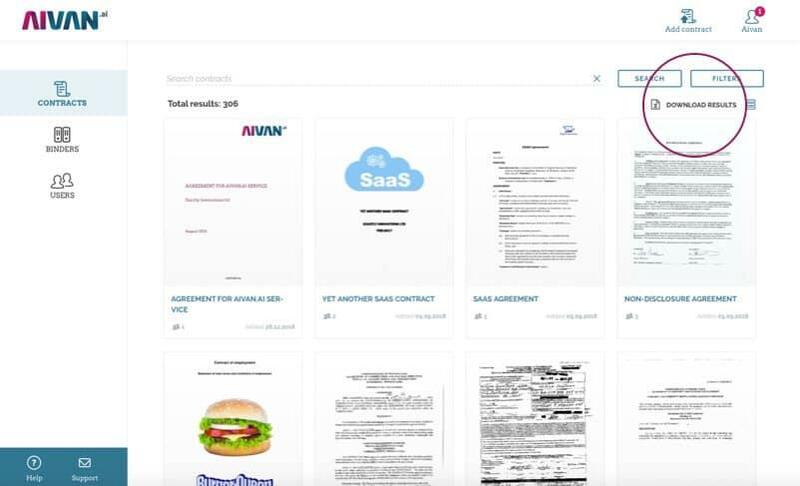 “View” gives user view rights to that specific binder and all sub-binders below it, including the contracts in these binders. “Edit” gives user edit rights to same content. ➜ To modify existing user rights, click the ‘pen’ icon right after the user name. ➜ To delete existing user rights, click the ‘cross’ icon right after the user name. You may export meta data of contract as .xls file (Excel file). ➜ in ‘Contracts’ view, limit the result list with a free text search and/or filters. 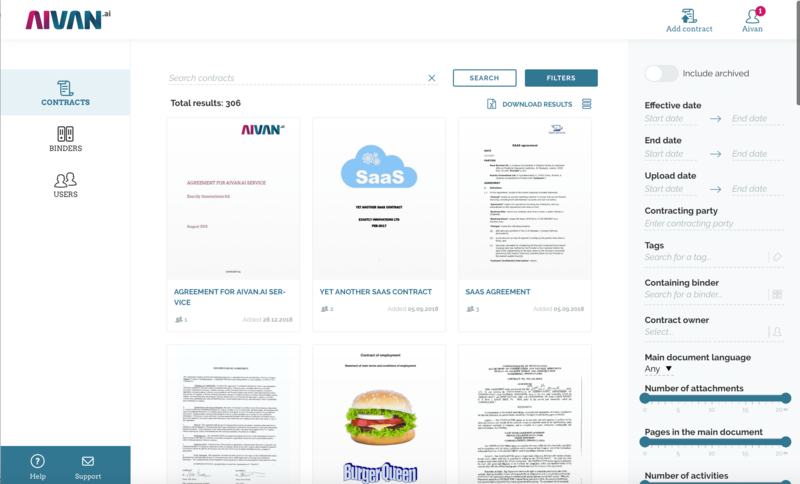 ➜ Click ‘Download Results’ button on top right corner to download metadata of all contracts in the search results. 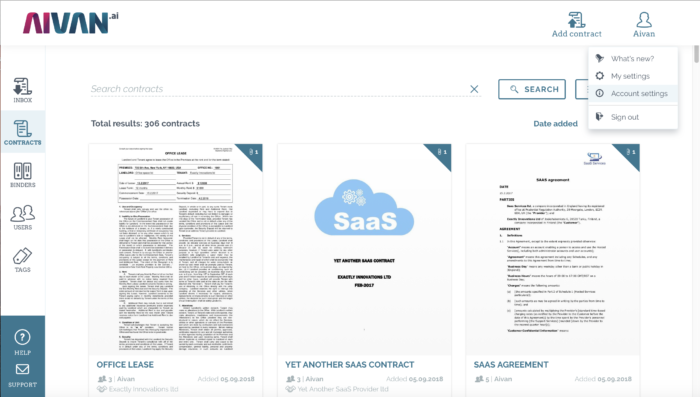 You may narrow down the contracts shown on the Contract Desktop (CONTRACTS view) by using filters. To open up the filters, click on the “FILTERS” button. Note: You may use both filters and free text search to limit search results. ➜ To open contract detail view, click on the contract thumbnail on CONTRACT view. ➜ You may add/edit contract metadata in DETAILS tab. ➜ To edit any existing meta data, just click on it and start editing. After you have done your changes, click “Save changes” button to save the changes or “Reset changes” button to undo your changes. ➜ To add new party to the contract, click “+ Add” button in PARTIES section. ➜ To remove an existing party, click “Remove” button below that party. ➜ In contract’s metadata in DETAILS tab, all future dates have a ‘bell’ icon attached to them (see picture above). ➜ You may quick create reminders related to that date by clicking that icon. ➜ AIVAN will propose three reminders based on that specific date: one three months before, one a month before and one 14 days before. ➜ By default, all three reminders are selected. You may unselect the reminders you don’t want to have. ➜ You may adjust the date and time of each proposed reminder. ➜ Select the user you want these reminders to be sent on selected dates. ➜ Modify the subject if needed. The default subject is contracts title and the date based on which the reminder has been created. ➜ Finally click ‘Add Reminders’ button to create the reminders. You may add the contract to one or more binders. ➜ Click “Add to Binder” button. A Binder pop-up opens. ➜ Select the Binder to which you want to add the contract. NOTE: you may add the contract to several binders. You may add as many activities to your contract as you wish. A reminder e-mail is sent on the date set in activity to the person set. You may also edit the message in the reminder. ➜ Choose ”Activities” – tab. ➜ Click ”Add new reminder” –button to add a new reminder to the contract in question. ➜ Enter subject for your reminder. ➜ Click ”Add reminder” –button to save the reminder. All reminders for a specific contract are listed on the “Reminders” tab. If you want to edit or remove a specific reminder, click “…” button on the reminder row to open a menu and then select the right action. ➜ Choose ”Files & Emails” – tab. – “Make main contract document” – this action will promote the specific file to main main contract document. 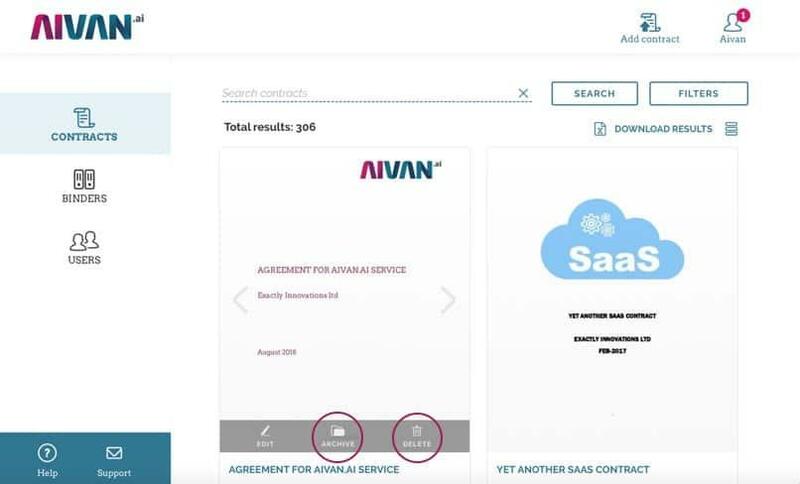 Main contract document is the file, which Aivan.ai’s AI-engine uses as main source for metadata and which is shown as a contract thumbnail. – “Change document type to other” – this action will change the document type to ‘other’. Typically non-legal files are set to ‘other’ type (such as the original word-document, which was used to create the contract). – “Hide this document” – if a file is hidden, only the users, who have editing rights to this contract, can see it (this is handy if most of the contract files may be shared with other users, but one or some of the files are more secret – those files can be hidden from all user with view-only rights to this specific contract). – “Download” – this action will download the file in question. – “Rename” – this action will rename the file. – “Archive” – this action will archive the file in question. Note: you can’t archive the main contract document. If you wish to archive that, you first have to promote another file to main contract document. ➜ You may upload new files to contract with drag & drop to the zone on top of the page. Clicking that are will open the file dialogue. Note: If you wish to upload a new main contract document. Upload it first as an attachment and then promote it to main contract document. You can attach e-mails to any contract and see and manage them on ‘Files & Emails’ tab. Video below shows how e-mails can be added to a specific contract. Contract owner and administrator may see a full audit log for the contract in Audit Log tab. 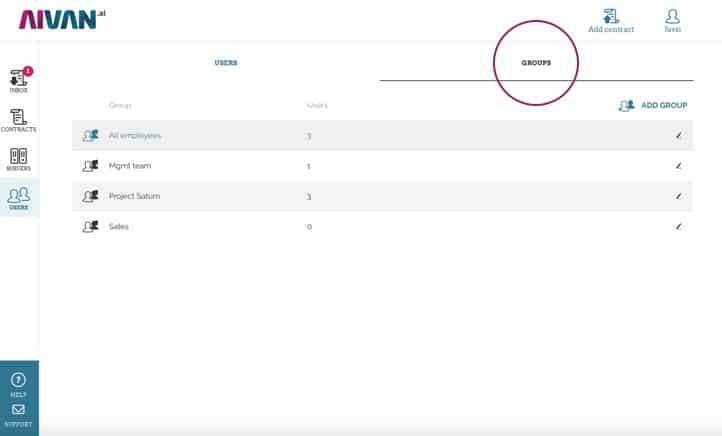 ➜ Audit log will show the list of user who have viewed or edited the contract. You may click any of the lines for additional information. ➜ You may also download the full raw audit file, by clicking “Click here to dowload the unfiltered raw log”. Aivan.ai service has a powerful search. Full contract text (including all appendixes which are uploaded in pdf format) is indexed for the free text search). ➜ You may use the free text search in CONTRACTS view. ➜ To perform a search, enter the free text string in the “Search contracts” field, and hit enter or click on “Search” button. When you type a simple word or phrase in the search box, Aivan.ai will search for those words in the same order. Aivan.ai will automatically search for different inflected forms. If you type in “love” in the search box, you’ll get results also for “loving”, “loves”, etc. We recommend using Aivan.ai with the most recent stable version of Apple® Safari®, Mozilla®, Firefox®, or Google Chrome™. Search results mark-up – the green color is not transparent in Edge. NOTE: Internet Explorer in not supported. You can manage User Groups in the user management view. Click “GROUPS” tab on top of the page to access User Group view. To add a new User Group, click “ADD GROUP” button on the top right corner. Now the new group will appear in the group listing. To edit user group members, click the pen icon on the user group’s row. User Group’s edit view will open. 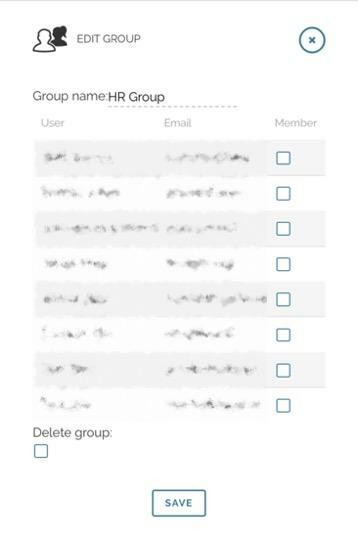 ➜ To add / remove users from the group, select / unselect the member checkbox for user in question. ➜ finally click “SAVE” to save your changes.. NOTE: Only administrator can manage users and user groups. To access User Management, click the USERS icon on left pane. To add a new user, click “ADD USER” button on the top right corner. ➜ Choose the activation time frame (if the user does not activate the account with in this time frame, the user account will not be created). ➜ Choose is the user can create new tags or not (note: the default value for this field can be set in the account settings). ➜ Choose if the activation e-mail is sent. NOTE: the remaining number of available user licenses is shown for each profile. You can edit or delete an existing user by clicking (…) icon on the user’s row.